Next morning's breakfast was also excellent. 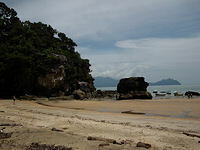 Today is our trip to the Bako National Park. We drove about 45 minutes to Bako fishing village to catch our boat to the national park. 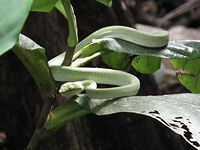 The park can only be reached by a 30-minute boat ride along the coastline of South China Sea. The water level can sometimes be too low for boats to reach the jetty for landing so we took off our shoes & jump off the boat in very low water to walk ashore. There is now a new café restaurant & also simple accommodation for overnight stay in the park. We can offer this arrangement at request. We began our trail in the national park with our guide, Henry. 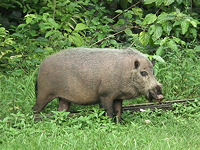 Very quickly we saw monkeys on the trees and a wild boar wondering around. The walk in the mangrove forest was difficult due to the humidity. The path is mainly covered by tree roots and rocks. I would recommend very good walking shoes for this walk. Henry was very good at spotting the monkeys in the trees. We saw a big male monkey in the trees above us. We stopped & watched him. 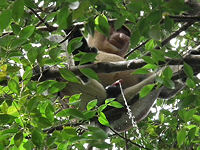 After a while I saw water dropping from the trees and my guide, Henry, told us it was lucky that the monkey pee at you. I am glad that it missed me, though. On the walk back we changed the route & walked on the beach looking for mud skippers & blue-fiddler crabs. We also spotted a long-tailed macaque sitting on the rail of the platform that we were going to go up to finish our walk. We sat for a while & the monkey came forward to sit right opposite to us on the rail on the other side. This is the closer that I get to a monkey at about 2 meters. The most important thing to do is not ot feed them and make no direct eye contact. We all sat for about 10 minutes or so until the monkey jumped off the rail and walked back to the forest from the muddy beach to join his own gang. It was quite an eventful morning. Although we had our packed lunch with us we decided to go back to Kuching as we do not want an afternoon trek after lunch. We arrived back to Kuching & had our packed lunch at a coffee house. Afterward we walked around old bazaar area (Chinatown) which still possesses the air of 1950 with many furniture shops still selling old-fashioned funiture. Time does not seem to have moved on here. 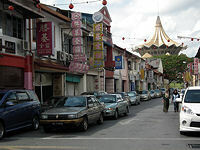 Like Kota Kinabalu, Kuching also reminds me of my early childhood days in Cholon, South Vietnamm, due to. the similarity of Chinese shops, Chinese eating houses, tea rooms, & the people especially the older generation. Next day was our last in Kuching & also of our 15 days Borneo & Brunei inspection trip. This morning we inspected the 5* Pullman hotel, 4* Riverside Majestic & 3* Harbour View hotels. For today's lunch I requested to go back to China Town for a dish that I also remembered I had in Cholon many years ago. It was the Chicken curry with potatoes. The only difference is that in Cholon they served it with French bread, in Kuching it is served with boiled rice. We sat at the café pavement & enjoyed my past dish once again. After lunch it was time to go to the airport for our flight to Singapore then to UK. The memory of Orang Utans, monkeys, the rainforest, the river boat trip to the longhouse, the sounds of birds & insects, the China Town in Kota Kinabalu and Kuching have captured my heart. The chili fried prawn, Chinese roast chicken & fried broccoli for lunch at the simple restaurant in Brunei stands out as the best food I have had. I hope you will all come & enjoy Borneo & Brunei too.